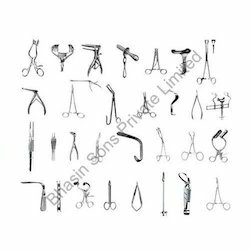 Our range of products include hospital surgical equipments and surgical instruments. Under able guidance of our skilled professionals, we offer Hospital Surgical Equipments all over the world. We use sophisticated technology and machinery for the process of manufacturing theseequipment. We offer these products at an industry leading price to please our clients. It is designed efficiently to cater a wide range of hospital surgical and diagnostic purposes, which encompasses of Vacuum Extractor, Abortion Set, Manual Needle Syringe Destroyer, Pediatric Suction Apparatus, Foot-Suction Apparatus and many more. Manual Vacuum Extractor (MVA) Set consisting of 3 stainless steel/plastic (autoclavable) cups, rubber pressure tube, suction pump, traction handle, glass jar fitted with vacuum gauge and control valve in wire cage, complete in carrying case. Manual Vacuum Extractor (MVA) Set consisting of 3 silicon cups in metal and plastic handles, rubber pressure tube, suction pump, traction handle, glass jar fitted with vacuum gauge and control valve in wire cage, complete in carrying case. 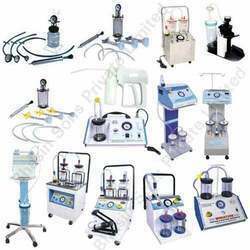 Abortion Set with vacuum gauge hand operated vacuum pump with 4 sets of cannula Packed complete in carrying case. Insert syringe nozzle fully into large orifice and hold squeeze handles with a fast squeezing action until nozzle is cut. Capacity: 550mm at 15-18 ltrs/min. Power: 220 V AC, 50 Hz, 95 watts. Vacuum Gauge: 5.80 cms (2.0 inch), 0-760mm Hg calibration. Bacterial Filter (0.3 micron) with reusable/autoclaveable housing between jar and pump. We are experts in manufacturing and exporting one of the best quality Surgical Instruments in the market. These products are manufactured in accordance with the analysis of exact medical specification and requirements using advanced equipment. The salient features of our products are it is highly reliable and cost-worthy. Owing to its user-friendliness, it has huge appreciation all over the world. It comprises of a wide range of surgical instruments, where few of them are scissors, forceps and holders. Looking for Surgical Equipments ?